A PUBLIC mineral exploration company is setting up office to explore silica in the Swang reserve forest in Assam. Over 800 elephants use the area as a corridor. The company had done a preliminary survey on the forestland three years back and found the area suitable to mine. The company has started making a road, set up a base office that is negotiating rates with labourers and collecting machinery for the work. But the company has not taken any clearances. Forest department officials said silica exploration in a reserve forest is under the purview of the Forest Conservation Act 1980, and therefore permission must be obtained from the Centre. 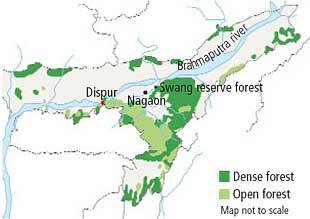 "The 2006 study was minor and permission for that could be granted by the Principal Chief Conservator of Forest, Assam.But exploration is big business and for this the Centre needs to say yes," said Bhupen Hazarika, senior forest department official at Nagaon district. In 2006, the company carried a surface study of the material. "The silica is about 98 per cent pure and suitable for the glass industry," said Vijay Meshram, project manager of the company, called Mineral Exploration Corporation Ltd. "Now there will be a detailed study and bores will be drilled to check at what depth silica is present." The exploration is illegal, said Simanta Goswami, director of the non-profit Green Guard Natures Organization. He hinted at vested interests. But according to Hazarika, the forest department reviewed the company's application for exploration and sent it to the centre with their comments. He said the comments included the fact that the reserve forest was prone to the man-elephant conflicts. Taking note of the reserve forest and the elephant corridor, said Goswami, the forest department should not even consider such applications. "Exploration would be an obstacle for the movement of the elephants to the Kaziranga National Park, and increase the conflicts," said Dulu Borah, Goswami's colleague. The Assam Pollution Control Board has no clue about the developments. "We have not received any application for clearance, and we are not aware of any of the company's activities. If they cause pollution, we will act immediately," promised Hemanta Gogoi, senior official at the board. The people are worried. "We are confused and suspicious of the company's activities. Company people tell us that the exploration work will begin soon but conservationists have told us they don't have the permission," said Biren Nayak, who lives in Nagaon. They have little hopes from the department after Montu Borah, forest officer at Nagaon, denied any knowledge on labourers or road being built. Forest department officials refused to comment on the company's activities.